Reviewed on 7th March for my other project Eat the Olympics. We seem to be heading to South Kensington a lot recently. Is this slowly becoming one of London’s hottest foodie destinations? Last night was the turn of traditional Scandinavian restaurant Madsen and we were visiting to tick the Swedish entry off our list. As we entered the narrow dining room, we were seated at our table by our very polite host for the evening next to a book case full of Scandinavian books, leaflets and magazines. After a quick browse, we were provided the menu and left to peruse for a few minutes. We all chose the gravlax to start, two of us opted for the Swedish “Tjälknöl” (£16.95) and one the slow roasted pork belly (£15.95) for main and we all had separate puddings – the Swedish Kladdkaka (£5.95), rhubarb trifle (£6.95) and Kransekage (£3.95). Shortly after we had ordered the room began to fill with the evenings diners. We overheard the Scandinavian waitress speaking in her native tongue to one of the diners before quickly switching to English for the table next door. 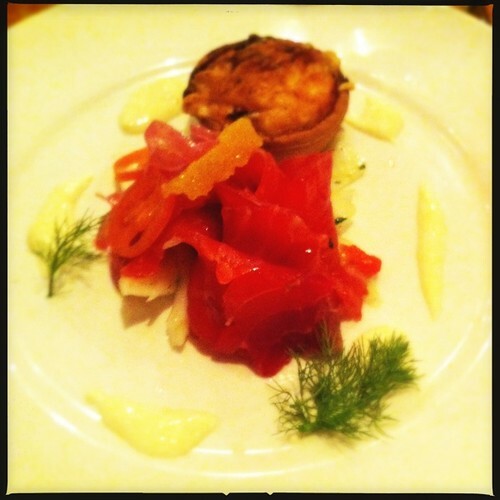 The starters arrived and the plate was beautifully decorated with deep red beetroot and fennel marinated salmon, an orange dressing and fennel salad, which was served with an accompanying Jarlsberg quiche. We thought the quiche, however delicious it tasted (which it did), was slightly out of place and was not really needed. The fennel salad was crisp and topped with a welcome acidic marinated red onion, which matched the tender salmon perfectly. 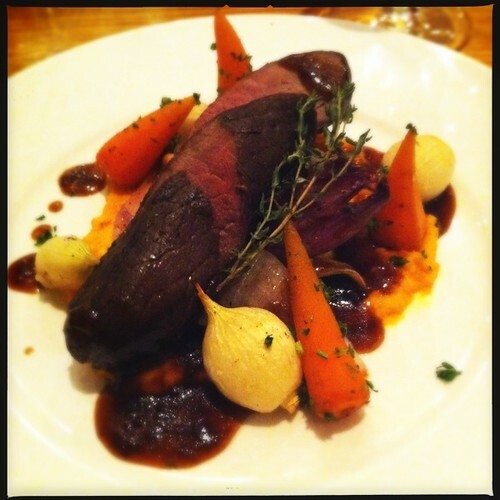 As soon as the Swedish “Tjälknöl” arrived at the table, we knew that the beef was undercooked. The topside of beef had been sliced into three pieces and only small parts around the edge were pink, the rest a dull brown colour. The first bite was disappointing; the meat was dry and not accompanied by enough of the rich beer sauce that we were so looking forward to. The seasonal vegetables were tender and well cooked and the side of new potatoes that we ordered soft and buttery. Despite the dryness of the beef, we polished everything off and eagerly awaited the arrival of our desserts. The Kransekage was a small and well formed cold chocolate cake topped with orange ganache and a quenelle of lingonberry ice cream with a smear of lingonberry sauce on the side. 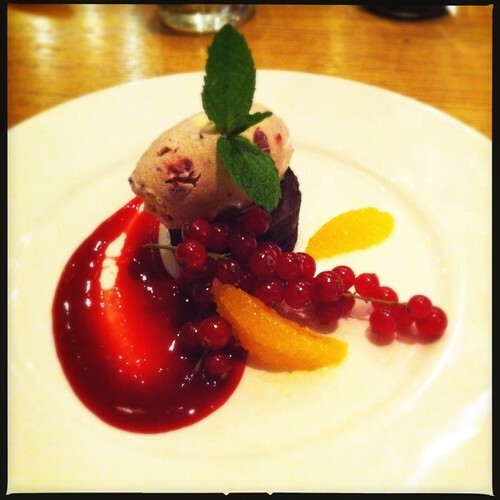 The chocolate cake was rich and gooey, the lingonberry ice cream fruity and delicious. There was no hint of orange ganache but the dessert was enjoyed nonetheless. The star of the show however was the rhubarb trifle, which instead of whipped cream arrived with a scoop of vanilla ice cream on top (as requested). The amaretto crumble was crisp, the rhubarb soft and sweet. We all agreed that this was the best dish of the evening. When our dessert plates were cleared from the table, we were shocked to see the time. We had enjoyed three hours at Madsen, a restaurant that we would describe as a cute little Scandinavian neighbourhood restaurant. We look forward to returning, next time to sample to meatballs. Thank you to Madsen for providing complimentary food for two. I ate here about 6 months ago. Did enjoy it but found the atmosphere a bit lacking. For such a design conscious nation, (and AFAIK the only Danish in London) – they could have gone further with it! I know what you mean actually with the design – the interiors weren’t that impressive. However, the restaurant was totally full and had a great atmosphere.